Not much is happening in the corner of MTG Finance I tend to know stuff about. A lot of my Standard-based predictions for Guilds of Ravnica were pretty iffy – I thought Tajic might have caught on by now (The best Wr deck is almost entirely Dominaria cards), I thought Dream Eater at $3 was a better buy than Doom Eater at $20 (It kind of was) and I would have bought more foil copies of Boros Locket at its original $1 the LGS wanted but I used that money for gas to drive to the LGS where I run the case to sell my Arclight Phoenixes for $7 each 3 days before they went to $20. Hindsight is 20/20 and while I have been doing just OK at guessing what Standard is going to do because I don’t understand the evolving Standard metagame better than the entirety of the Magic community but I did nail a few picks and I think I’ve been doing this long enough to have figured out a few long-term trends. I think there are some foils in Guilds of Ravnica worth harping on about and while we have a bit of a lull in anything really going on in EDH because no one is building decks with Guilds commanders right now because they’re either bad versions of existing decks or identical versions of existing decks or they’re Aurelia, I think various formats can still impact the prices moving forward and they’re worth discussing. Let’s look at some foils. You know, or whatever. I feel like I’m taking a break from stuff I care about lately – I really hope the next Ravnica set gives us some good EDH stuff or I’ll get so rusty at finance I’ll assume the next card with “Phoenix” in its name won’t be $20 even though that isn’t happening much lately. I think this is a $10 foil. Obviously it was better to get in closer to $2 or $3 a week or two ago but that was then so let’s talk about now. 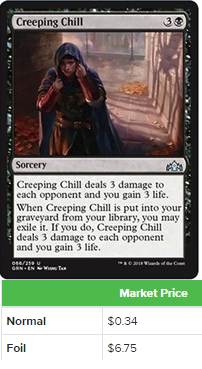 Now Creeping Chill is a card that is cheating in Dredge. This is going to disappear in playsets which is good because there are a lot of foil uncommon from Guilds of Ravnica because I’m guessing it’s the best-selling Magic set of all time or will be soon. This seems like a bit of a gainer after we pass peak supply. It’s a powerful card and while it’s a bit narrow, it just seems like the sky is the limit on this. If you can buy in around $5 it seems like you’re going to be hard-pressed to lose, but this is probably more useful as a baseline case. Cards that are strong and identified as players in Legacy and Vintage command a high foil premium are coming in around this level at uncommon and this should more than maintain the price. For whatever reason, despite there being way fewer players, Legacy foils just tend to pop like this. I’d like to point to some recent historical precedent for a card like this being $10 or $12 but there really hasn’t been a card like this lately that is so perfect but so narrow. However you feel about foil Creeping Chill at $7, you should feel much more strongly about Chromatic Lantern at $7. Is Lantern getting pounded into the dirt by reprints? Yes, kinda. But how likely is this to get another printing in foil anytime soon? The Commander precons are an excellent place to reprint this and keep the non-foil price down to under $5, but if the non-foil got above $7 even after its first reprinting, I don’t see a better place to park your long-to-medium-term money. 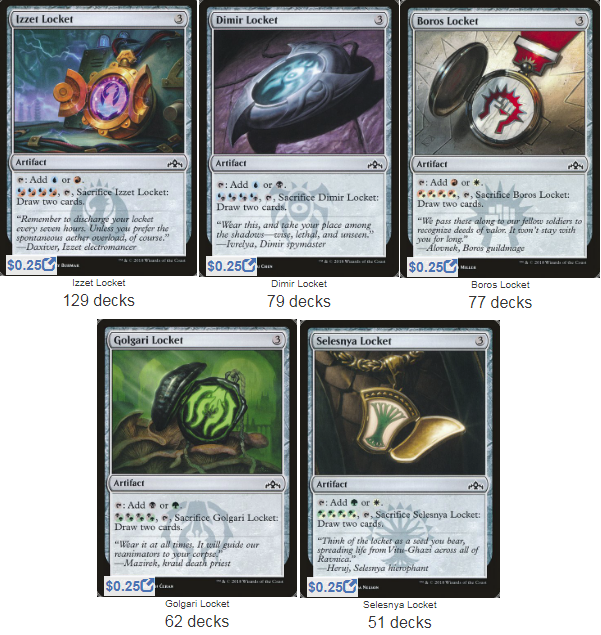 Lantern is in like 57,000 decks on EDHREC and when you consider it was a $20 card in December of last year and people were still jamming it in decks more often than Commander’s Sphere and Darksteel Signet which are both pocket change, you know how important it is to players to be able to be LAZY. You can be so lazy with this card out. 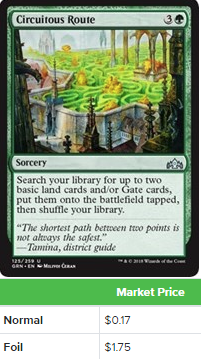 You can’t tap mana wrong, just tap the number of lands equal to the CMC. This card makes turns go faster AND it taps for mana itself. Playing spells with Lantern out lets you be almost as lazy as I am right now calling this at $7. 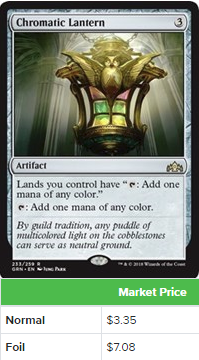 I mean, if you do nothing else in MTG Finance this year, spend $100 on $7 Lanterns. Use some of the profit to by Pro Trader access for a year so when we have weeks where stuff I can help you with happens, you’ll know about it before the general public. A 2x multiplier is non-correct. All of the foil shocks in this set are historically low. I realize that this art isn’t as desirable as the Guildpact art but is the Guildpact art 5 times better? I happen to prefer this art in foil and the fact that these are around $20 seems like cheating. Could these be $50 in a year? I don’t know. Could they be $17 in a year? No way, I can’t think of circumstances where that happens. 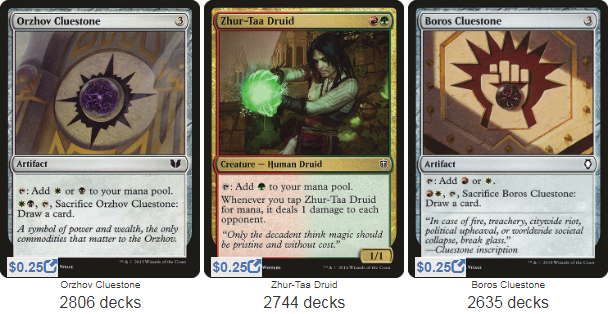 As we get farther from peak supply (which hasn’t even happened yet) I think these are going to realize they’re played in a ton of formats where people like foils. I don’t think these are $100 but I don’t think $20 is reasonable, either. This is a 10x which seems fine. What people may not realize is that this is the 9th-most-played GRN card on EDHREC. That’s more than Price of Fame, Doom Whisperer, Niv-Mizzet, Thief of Sanity and Sinister Sabotage. At under $2, foils of this are pretty attractive. 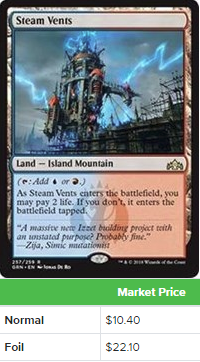 This is a solid card that I expect people to continue to play and I’d like to think a playable foil can pull $2. I could be wrong about the sustained demand since it will all come from EDH, but this is my first set really paying attention to prices before they settle rather than after. Interestingly, one more thing. I was pretty bullish on Boros Locket at first, but a few things happened. First, people didn’t really do what I expected. Despite having access to Blue which means access to actual card draw, people are jammming the Blue lockets more than the Boros Locket, and maybe that’s because no one is making new Boros decks because of this set and they are making new Izzet decks with Niv-Mizzet and new Dimir decks with Etrata and Lazav, but I also think I didn’t do a great job of predicting what would happen with the prices or the distribution. I still think Boros does well long-term, but another thing is worth noting, and you won’t like it if you paid close to $1 for Boros Locket when it first came out. 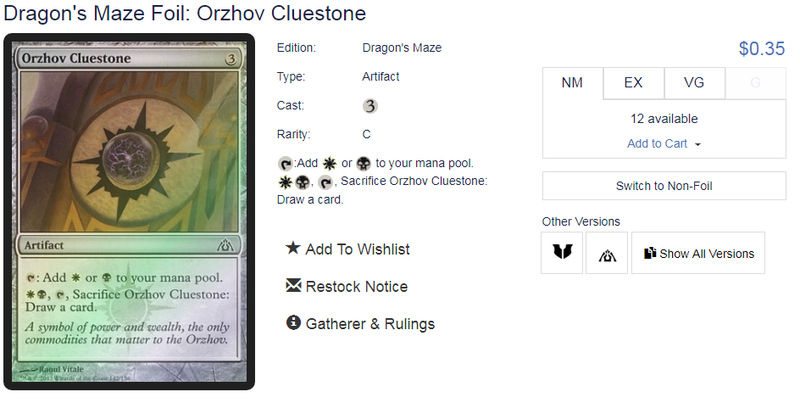 Not only is Orzhov, a color combination with access to Phyrexian Arena and Tymna the Weaver running Cluestone more often than Boros decks, they aren’t running them THAT much. Want to know what’s worse than that? Orzhov Cluestone foils aren’t worth diddly. They’re practically the same price as the non-foils. And that’s from Dragon’s Maze, a set that was so bad that boxes are basically dealer cost 6 years later. Stay the hell away from lockets, even Boros and Orzhov, unless they’re the same price as the non-foils and even then, no one is going to care. That’s a lesson for me as well as the rest of you. Yikes. That does it for me this week. I don’t hate any of the shocks, really, especially Watery Grave and I don’t really know where cards like Venerated Loxodon will end up. I think there are a lot of copies of the cards in this set and even the foils are going to continue to tank. When prices begin to recover, we’ll be there waiting but until then, look stuff up like I didn’t with the Cluestones. I bought maybe 3 or 4 Boros Lockets for $0.75 each from the LGS and they’ll trade out at $1 or so but until then, I’m stuck with a reminder that I should wait for data before I buy. Luckily, I mostly knew that and didn’t buy deep. That’s all for me this week. Until next time! I am looking for help, could someone please try to help me? I have signed up (and paid) Pro Trader two weeks ago but I do not get any Emails at all. Well, I got the mails that signing in etc. worked, but unfortunately since then I did not get any “daily mails”. I tried to ask “support”, but it is not working. I wrote several times to the webmaster-adress, but no one replied. Ah, and I checked the spam-filter already, there is nothing in it either. very glad you answered me, thank you very much! Since I have not tweeted anything until now I would be very thankful if you could help me like you mentioned. I hope that there is a solution, because I really like the site and your insights.